Up at five am to catch flights to Nelson, then a shuttle bus to the top of Graham Valley Rd for lunch at the Flora carpark. The thirty or so cars had us thinking we would be tenting that night, but most were day trippers climbing Mt Arthur. About one and a half hours of easy climbing through sub-alpine scrub with lots of big neinei (Dracophyllum) brought us to the cosy 8-bunk hut just below the bushline. A family of weka entertained us scavenging for anything they could carry that might be food, and we got in some practice for guarding our belongings—we met families of weka at every stop along the trail during the next four days. A short stroll beyond the hut gave us magnificent views across to Nelson. At 7.45 am we set off on the easy-grade track to the summit. About an hour and a half up, we hid our packs at the Gordon’s Pyramid turnoff and continued climbing for another hour and a half to the summit. Lovely weather, beautiful alpine flowers and magnificent views. Gordon’s Pyramid looked easy—just a few ups and downs along a ridge—but how wrong we were. Packs back on after lunch at the junction and the first steep descent then steep climb warmed us up. The rest of the day was very hot, lack of fitness took its toll and I had a cold. For various reasons, especially the hot weather, we always took longer than the official track times, but it wasn’t a problem as we had plenty of time. The summit of Gordon’s Pyramid rewarded us with more wonderful view, with Salisbury Lodge visible in the distance. 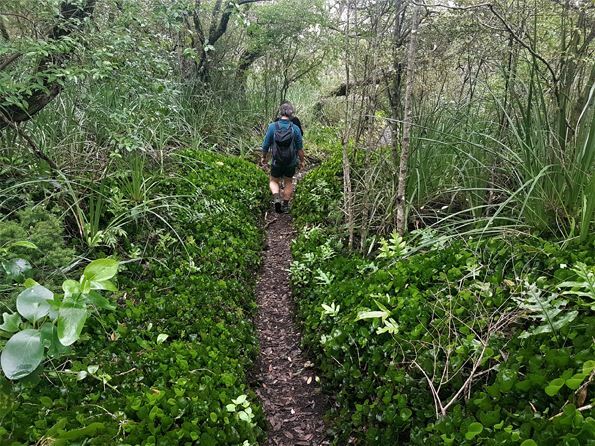 A very steep descent through bush and interesting limestone formations, then a long but gentle climb to Salisbury Lodge. The glorious evening enticed six of us to erect tents while the one member with earplugs slept inside the full hut with a noisy three year old. A nice hut with twelve bunks, but the narrow seat attached to a table was a trap and we nearly had a casualty with concussion. Weka here were very busy so tents were kept zipped, but in the morning someone forgot about the weka, which was last seen running off to the bush carrying “someone’s” bag of rubbish! It would have been chased if “someone else” was not rolling on the ground laughing. On the third day, the white stuff on the tents was frost, ironical since that day became came one of the hottest of our trip. The four ladies enjoyed the loop walk to the Potholes and Sphinx Stream. We didn’t solve the mystery of where the cave was, but we loved exploring the sinkholes in the limestone with the gentians and bulbinella flowers. 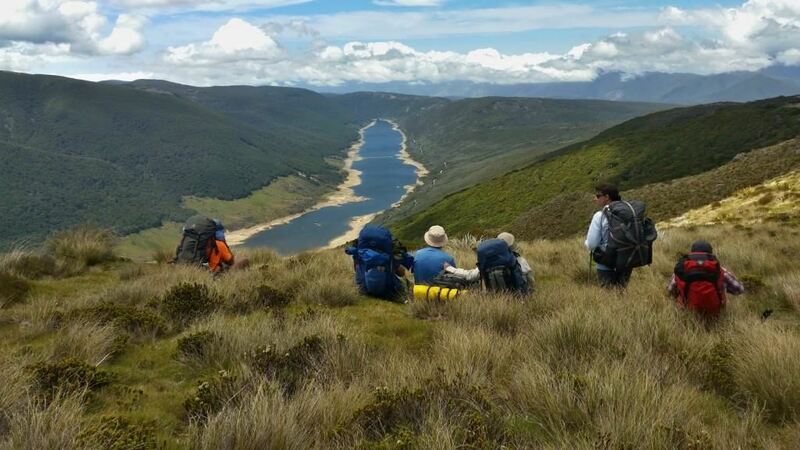 We returned to drop tents and head across the tablelands: Salisbury Lodge to Balloon Hut, then Lake Peel for lunch and out over Cobb Ridge to Trilobite hut (see photo above) at the head of the Cobb hydro lake. This took most of the day as it was very hot, and overheating and blisters slowed us down. From Cobb Ridge, we had a great view of the lake with its very low water level. 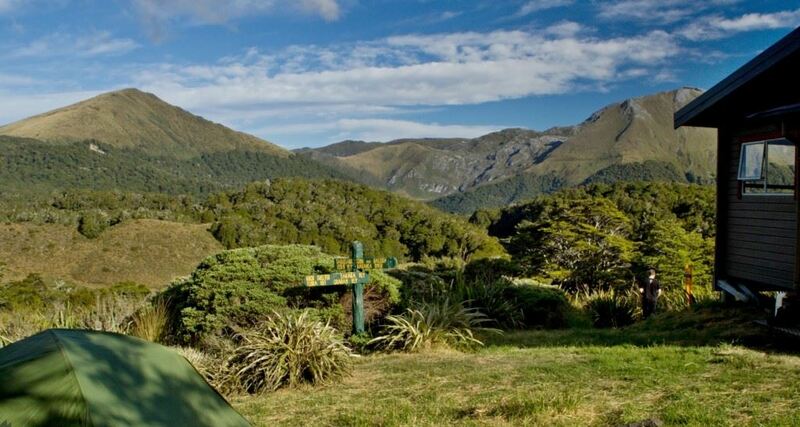 Nice camping conditions, so some of us tented beside Trilobite hut. As we were heading to bed, the extended family, which included two young children, arrived from Salisbury Lodge. They came via a different route, and the children did well (they were carried through the spiny speargrass, which was face height for them). 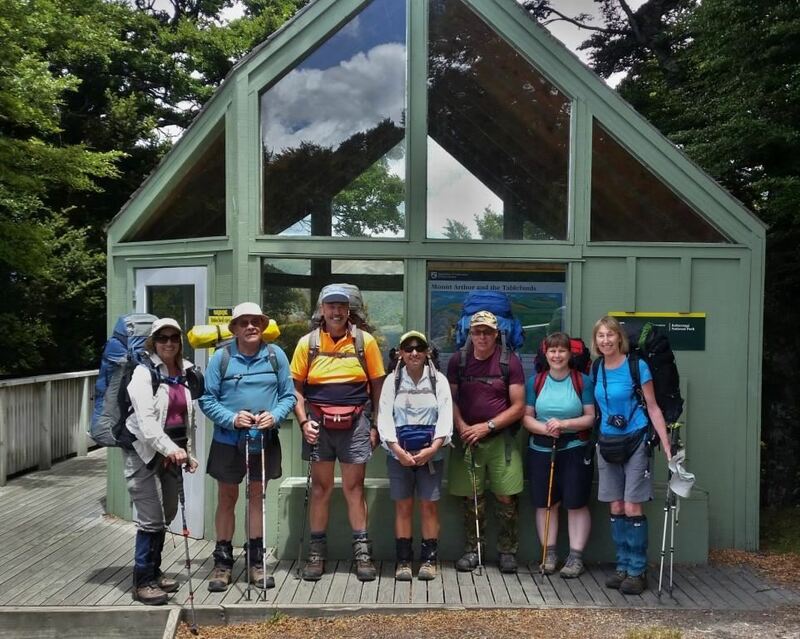 On day four we went up the Cobb Valley past rustic Chaffey hut, recently restored, then to the NZ Forest Service tent camp for lunch. Also nicely restored, it’s a classic design dating from the pre-1950s deerculling days before huts were built for the cullers. 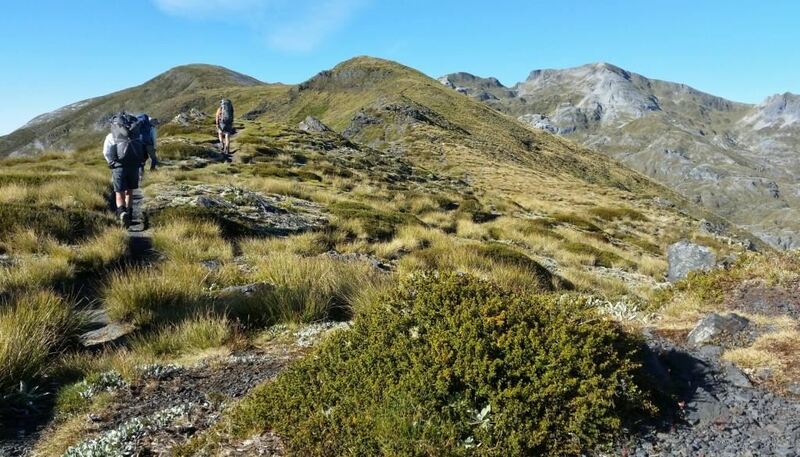 Due to blisters, three people chose to stop at Cobb hut for the night while the rest of us continued for another thirty minutes to Fenella hut. Cobb hut is a classic old 4-bunk hut while Fenella is a luxurious 30-year-old hut, famous for its loo with stained glass window and door, and a handbasin with continuous piped water. 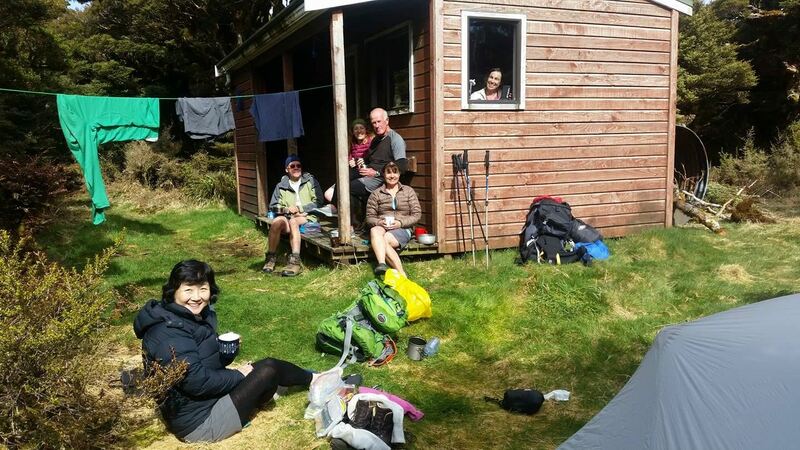 Fenella has marae-style bunks and mezzanine, and we enjoyed the afternoon sun and views of the mountains. A 10-minute walk up through the subalpine scrub was well worth it for the glorious swim in the lake and much needed wash.
Jan and I photographed bog plants and dragonflies nearby. If we’d had the energy we could have climbed nearby Kakapo Peak, but after the swim it was nice to snooze on a bunk in the sun. We met an older gentleman who was climbing the nearby mountains with his daughter. He told us about Friends of Flora and Friends of the Cobb, two groups of volunteers responsible for the abundance of weka and robins in the area, thanks to their dedication in setting hundreds of stoat traps along the tracks and elsewhere. Sadly, we didn’t hear or see kea anywhere, except near Flora carpark. 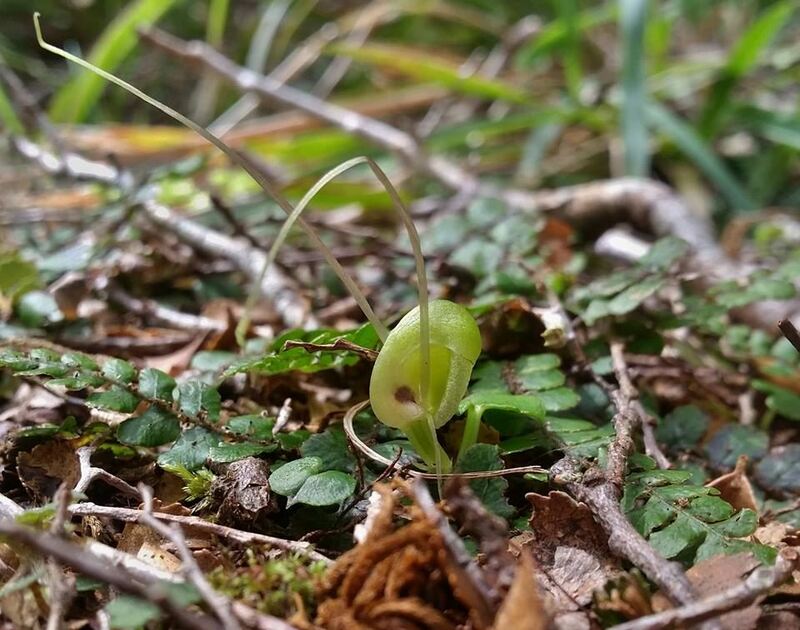 We hope that efforts to control stoat will bring them back to our mountains. On the last day we went back down the valley to Trilobite. Three of us detoured to Lake Cobb, enjoying the dracophyllum forest and several very friendly robins. The mystery solved? Remove the predators and the birds will return to our forests. It was such a joy to be greated by a robin nearly every time we stopped. 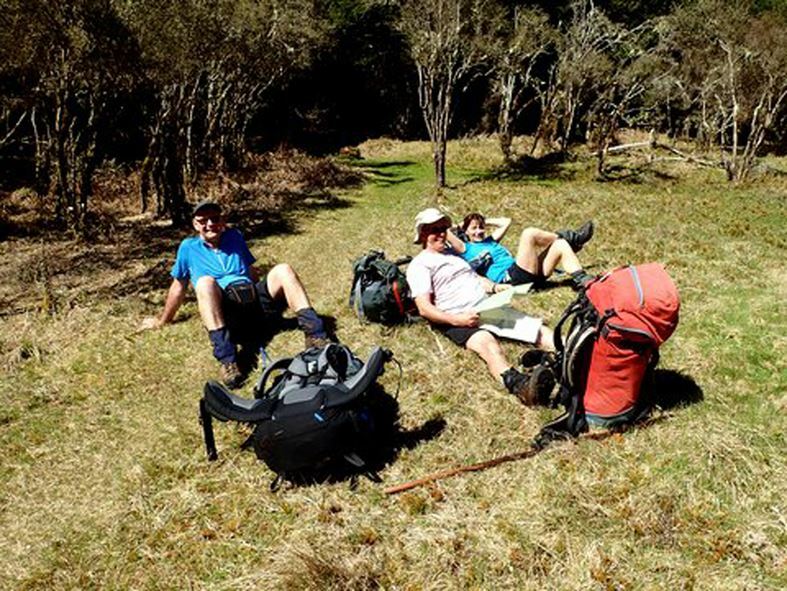 The Whangapeka-Leslie trio joined us near Trilobite hut. Big thanks to Neil and Gillian for the long drive from Collingwood to collect us and take us back there for showers, clean clothes and New Year’s Eve dinner with members of all the other parties. Thank you, team for your wonderful company. Two years ago I suggested to Roger that we do one of my bucket-list trips to Brewster Hut at Christmas. 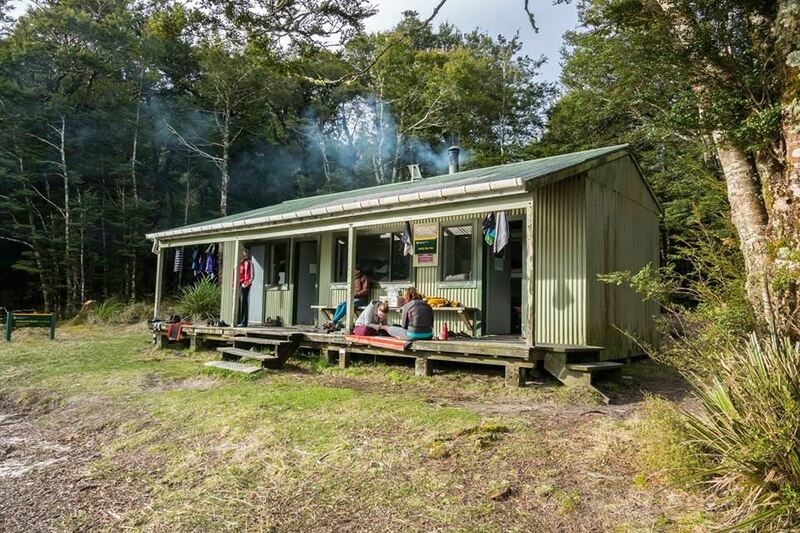 That came up tops so then I suggested we do another from my BL—to the remote Kahurangi Keepers House (DOC hut). 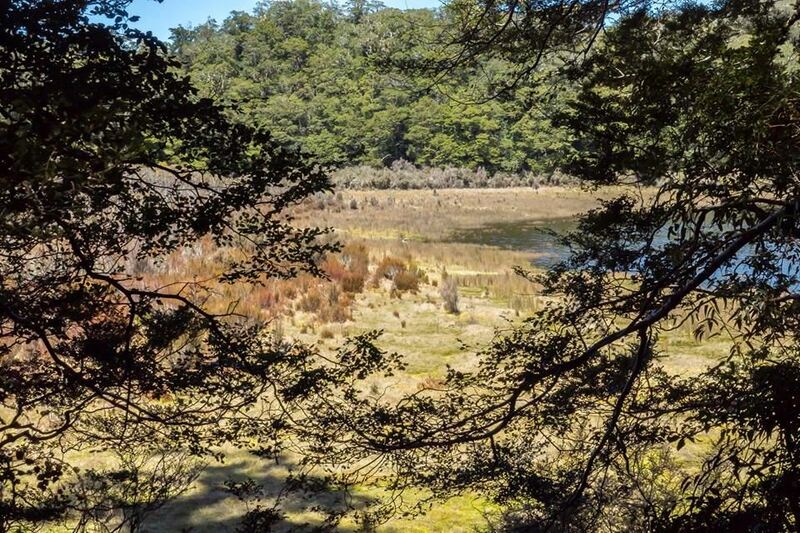 By the time we had all done our 5-day Kahurangi high-country tramp and overnighted in Collingwood, the numbers for the coastal walk had dropped from twelve to just six. No problem. We set off on what turned out to be a scenic 2-hour drive to the West Coast. 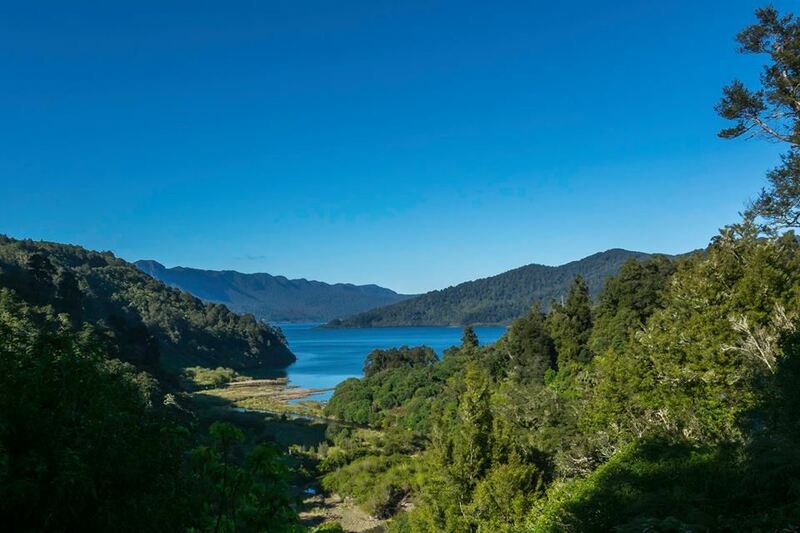 The first hour had us beside the forested Whanganui Inlet, with southern rata in full bloom. 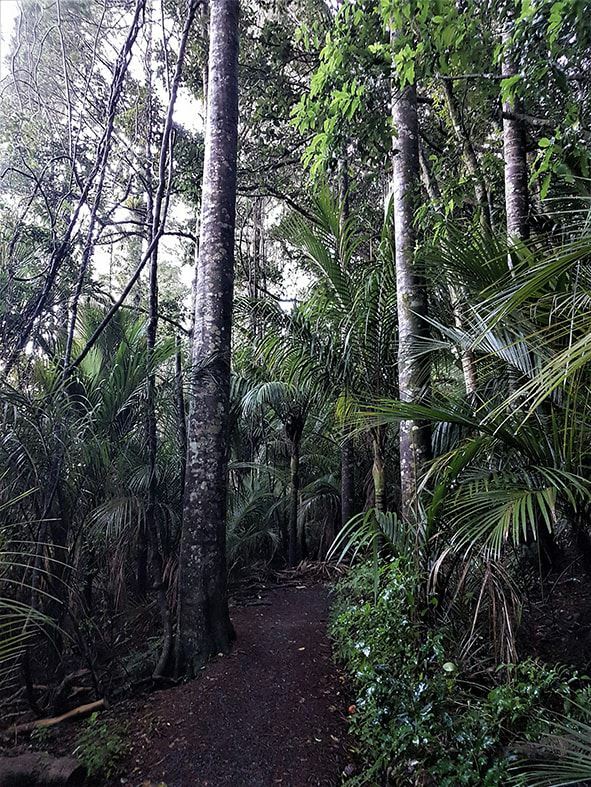 Then we passed through karst landscapes, with amazing groves of nikau. Finally we arrived at the Anatori River, which was as far as our vehicle could go. From here onwards it was 4-wheel-drive country. Just as this trip was on my bucket list, so it was for the 4-wheel drivers and quad bikers. Not such a remote destination after all. For our lunchtime entertainment, we waited for the tidal river to drop low enough for the vehicles on the far side to cross over. Once they had done so safely, we crossed in the same spot. We climbed up the road and took off cross-country, passing through farmland and descending to beach level. We forded a further two streams before coming to a stop at Big River. The DOC notes strongly advise that this river can only be crossed at dead low tide. Again, we watched the 4-wheel drives cross and then linked up in two groups of three. We made our way across safely, with our shorts getting wet in each of the three troughs we encountered. 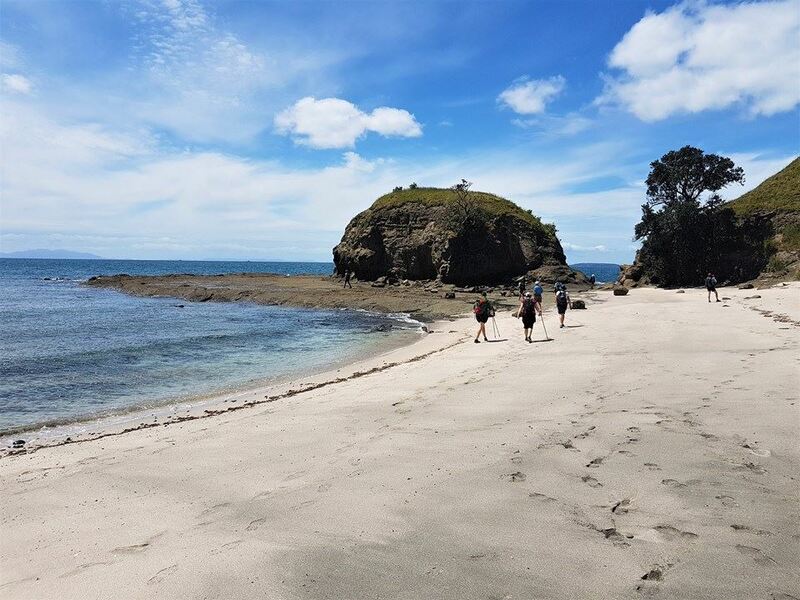 From Big River to the lighthouse is an easy walk along the white sandy beach, which has subtropical forest right at the water edge and groves of nikau. It should be called the “Nikau Coast”. 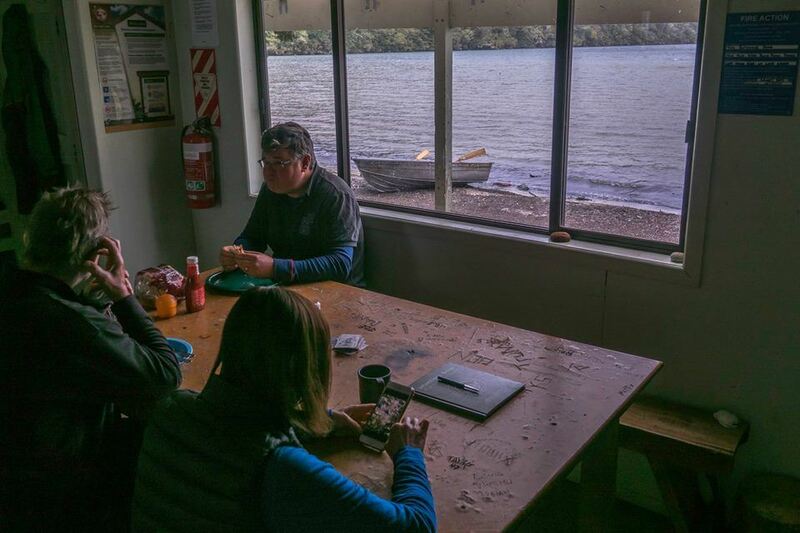 We marched up to Keepers House and were glared at by the 4-wheel drivers who Keepers House and the Kahurangi Lighthouse had taken up residency in the house or camped around the grounds. One of them suggested we might want to camp in a nikau grove down by the beach. We were pleased to do that because it gave us our own space, and we only ventured up to the house to fetch drinking water. 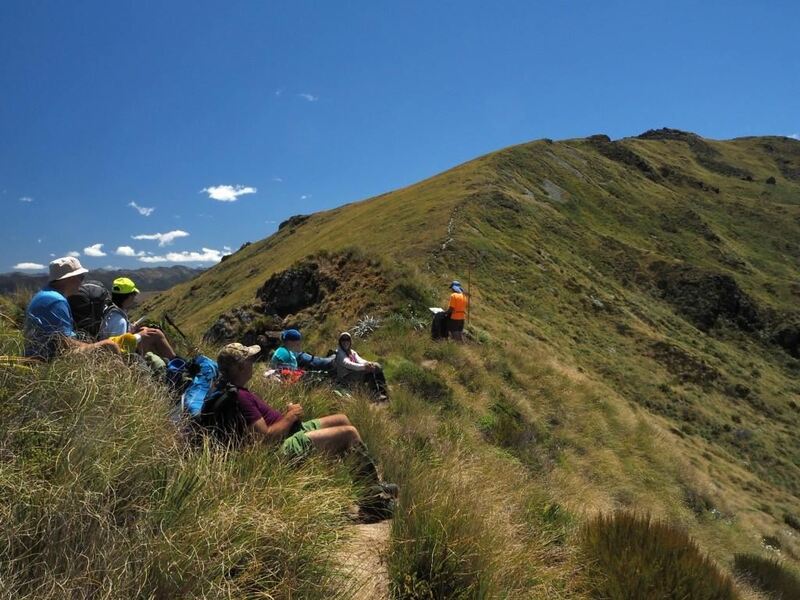 The next morning after breakfast we bush/long-grass crashed up the ridge and along to the Kahurangi Lighthouse. We had to do this because vehicle drivers use the low tide to go around the point and then walk straight up. It was high tide so we needed to use the ridge. Back to camp for a leisurely lunch, in mid afternoon we headed back down the beach to Big River, where I had a swim. We waited for the tide to recede before we again followed the vehicles across. We went back much the same way and as it took us until eight pm to arrive back at the Anatori, we enjoyed the late-afternoon sun highlighting the Kahurangi hills and forests to our east. And it got even better as we drove in the Twilight back out to Collingwood. 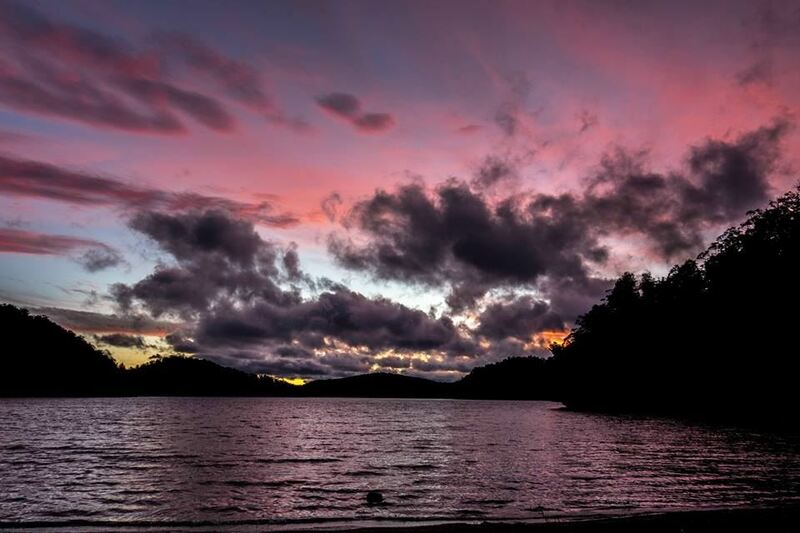 Shots were being taken of the incredible orange and pink in the sky and on the waters of the Whanganui Inlet. The supermoon was up in the east as we drove back into Collingwood at ten pm. That made up for missing dinner! 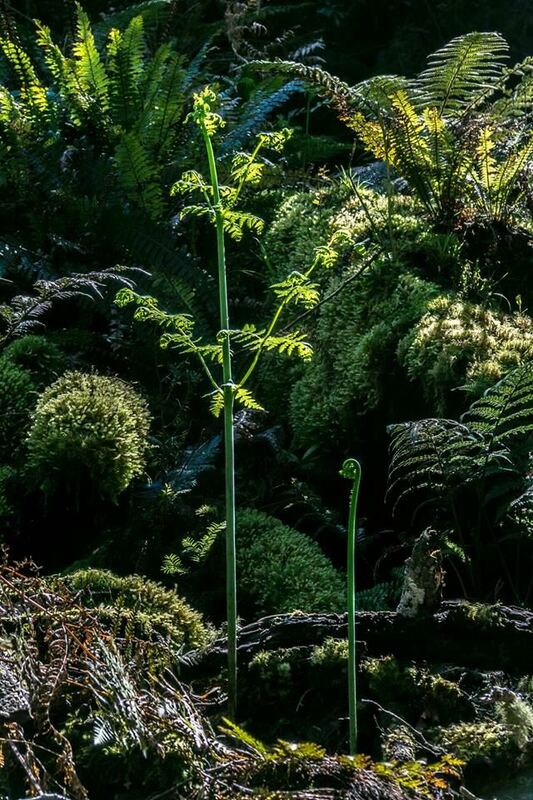 If we’d gone at any other time of the year we might have shared this lovely bit of NZ with only a handful of others. 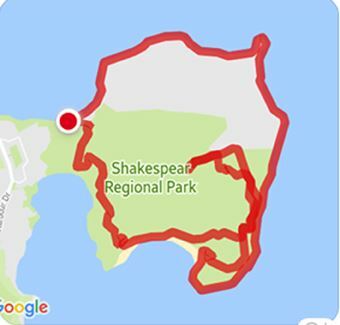 I was pleased to have done this walk. The river crossings made it an adventure and the subtropical forest backdropwasis stunning. Thanks, Roger, for driving us in and out safely, and for providing a tramping week where we went from a 1500-metre sub-alpine height to a subtropical beach paradise. The Keepers party: Roger, David, Paul, Helen, with co-leaders Beth and Karen M.
After a week of slightly dodgy weather, Sunday morning dawned just as hoped for our group of nineteen as we made an early departure. There were a few fun and games, and Karen did really well shoehorning our big yellow bus into the Sandspit pay&display carpark. No escape from the parking meter anywhere! via Kawau to drop a couple off. We had a slightly choppy crossing to Motuora on our character-filled boat, but there were calmer seas as groups boarded the inflatable boat to shore. tracks at the southernmost end of the island are pretty overgrown, but it was much better through the rest of the island. One of the favourite spots for the day, was the aptly named “Still Bay” on the eastern side of Motuora. It’s an absolutely gorgeous, almost encapsulated bay, with its own little island that we all thoroughly enjoyed exploring. We could happily have stayed all day, but lunch and a great lunch spot were calling. We had picture-perfect views and soft grass to loll around on. 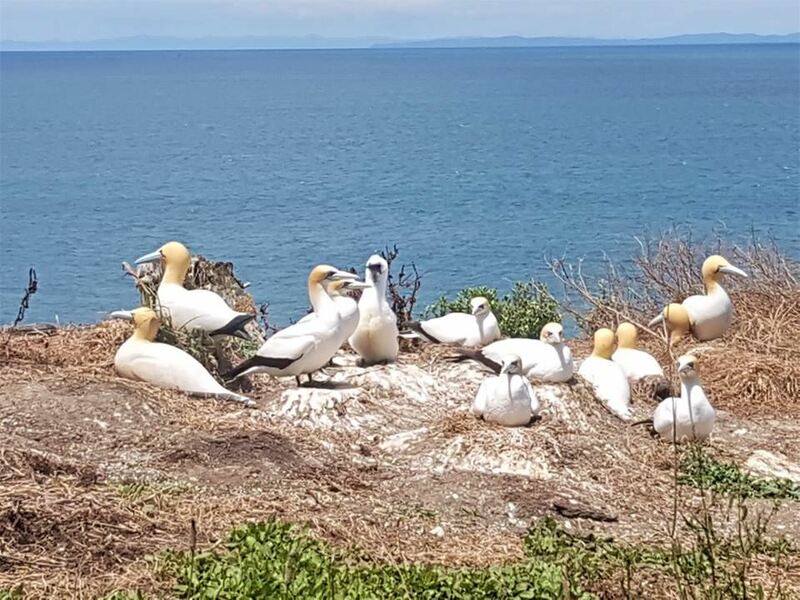 With more to see, we headed north up the island and found the beginning of a gannet colony, with babies nearly as big as their parents! There were real gannets sitting contently beside plastic gannets, and gannet and other bird noises blaring from the speakers close by. After we’d covered the tracks on the island, we headed back to the drop-off point to swim. We were being watched constantly by the vigilant dotteral daddy, who kept an eye on us all until our charter arrived at 3.30 pm. Our second inflatable boat trip of the day took us back to our vessel. Thankfully the breeze had dropped; if it hadn’t, we might have been waiting a while. 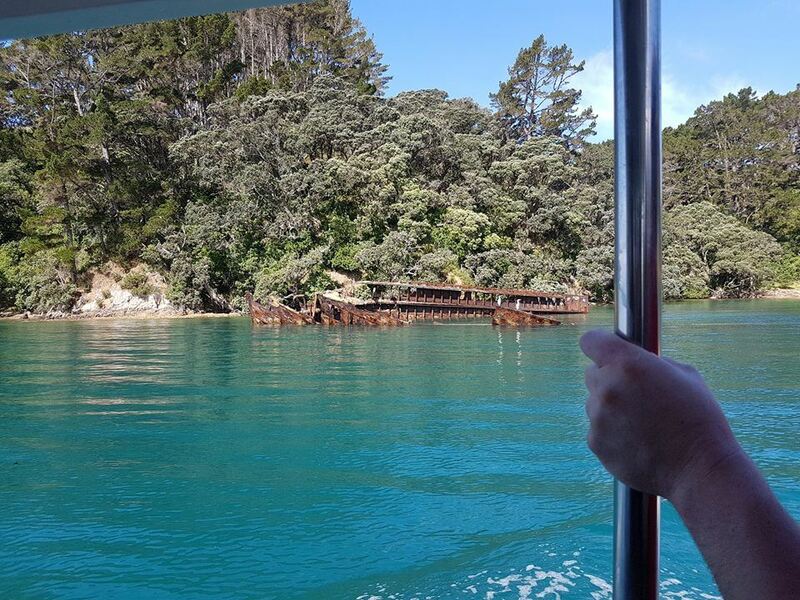 On our way back to Sandspit, the captain kindly stopped by another adjacent island to show us the wreck of the historic, surprisingly large Rewa. Motuora is a lovely island, and the bird life is pretty cool, so if you have the chance to sail/motor there, or hire a vessel, or even paddle there, it’s worth doing (we did meet a paddler at Still Bay who had come over from Martin’s Bay). 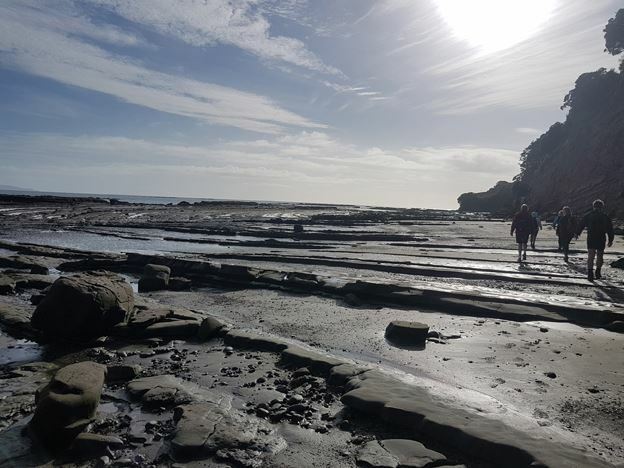 And if you time it for right on low tide you’ll have more to see around the foreshore and can explore an extra track. More photos from the the Labour Weekend 2017 trip. … but by the third day I was starting to wonder about one of our new members! So said Sunday morning’s paper. So said the club promo for today’s trip. And it was raining. What a great start to the day. 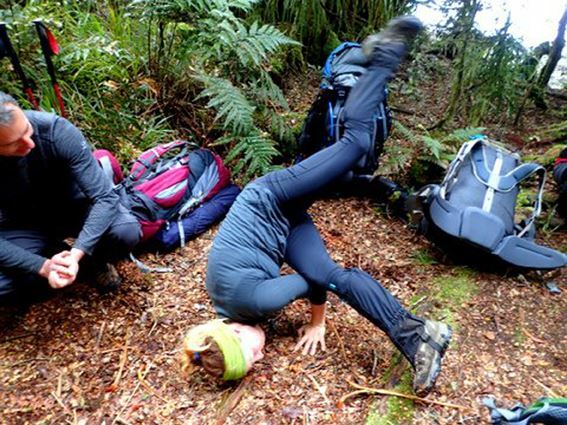 How many trampers would turn up at eight o’clock? Well, the answer was four. But there was no bus, and no bus driver. Our coffee break was extended slightly while we considered our leader’s proposal of an Okura walk. In the event we had a great day out. 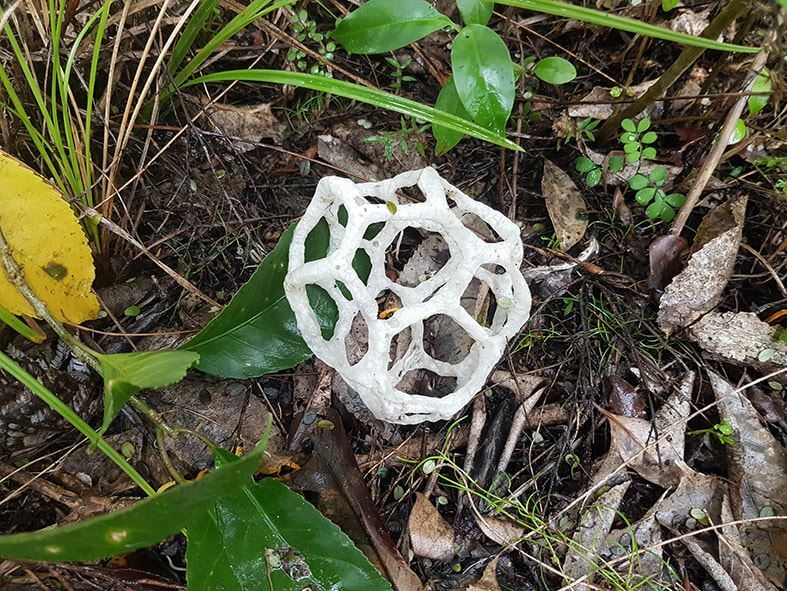 There was much talking as we made our way along the Okura Walkway. And the rain stopped, with occasional bursts of sunshine. With the tide out, we were able to make our way along the coast for part of the walk. Our early lunch at Stillwater was accompanied by a little light rain. On the return trip, we could see the black clouds coming up from the south, but the heavy rain and wind was thankfully of short duration. 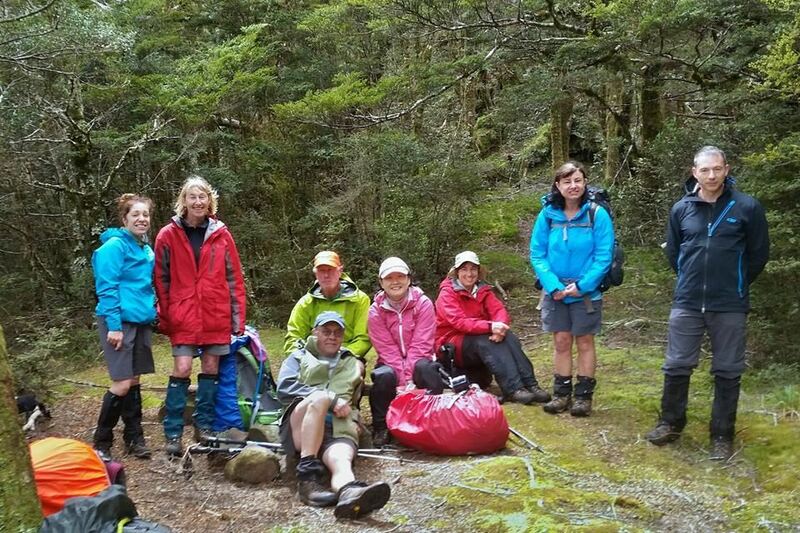 Another amazing day out with the tramping club. 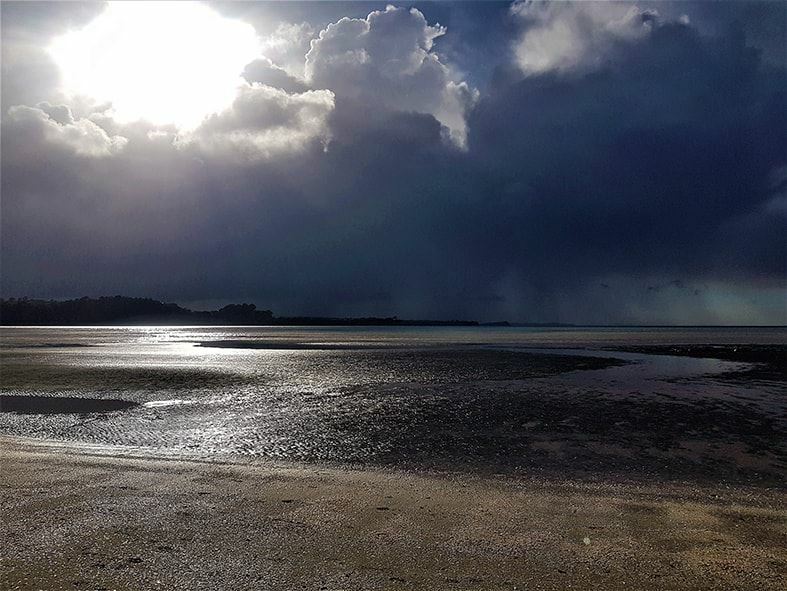 The skies looked dark and threatening, and there were showers nearer Orewa to start, but a nice brisk breeze blew the black clouds away without dropping their contents on us. A great group of members and fit newbies started the day bright and early, catching the low tide at eight am at Army Bay. We started by taking in the amazing geology, with pushed-up rock faces, and you can only imagine how much the ground would have been rocking and rolling back then to create these impressive formations. We had a quick stop at Pink Bay for morning tea as we were making such good time, even on the slippery, rocky surface. Then onto the point where we should have all ended up with very wet feet, but to our surprise the tide was so low that we were able to scoot around the edge. No scrambling up and over there. 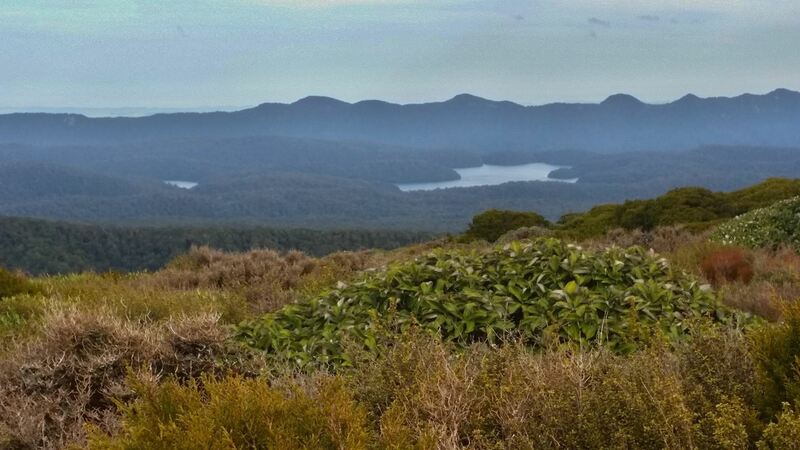 After quickly completing the bit around the end of the peninsula, we headed inland, to the perimeter Tiritiri Track and a bit of hill work to wake up the muscles and lungs, with our goal of enjoying an early lunch overlooking the stunning scenery at the summit lookout. Even though we had a big group of sixteen, we moved at a good speed and were able to stay as one group. We went through the bush tracks, just to make sure we ticked off as done all except two short tracks. 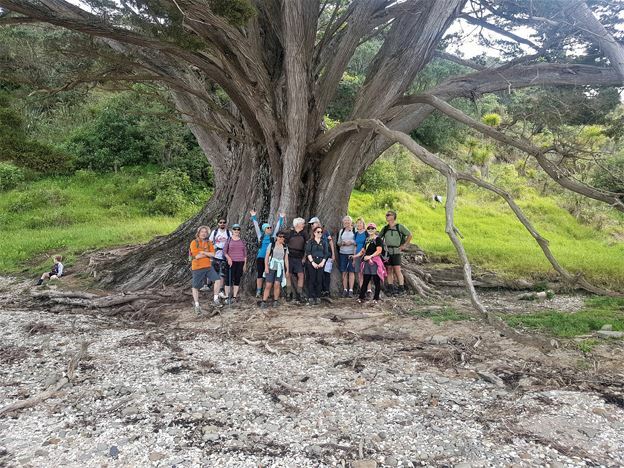 To top off the day, most of the group posed for a photo under the huge macrocarpa at the end of Te Haruhi Bay. 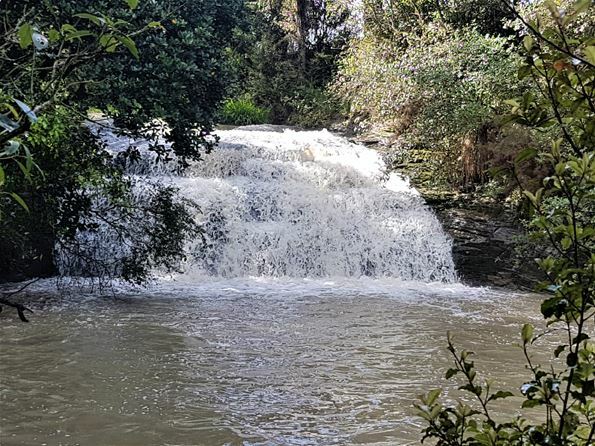 There was one bit where we walked over the muddy cattle paddocks to the picturesque Waterfall Gully Track and the pretty waterfall, via another track where multitudes of tui were having a feeding frenzy on karo, kowhai and other blooms. Our intrepid group of NSTC’ers and three newbies didn’t let the weather stop us having another supercool day out with the club, tramping around Albany and up to Unsworth, with a variety of tracks on the way back. We had thunder and lightning twice, hail, some heavy rain, lots of mud … and we made the most of it. 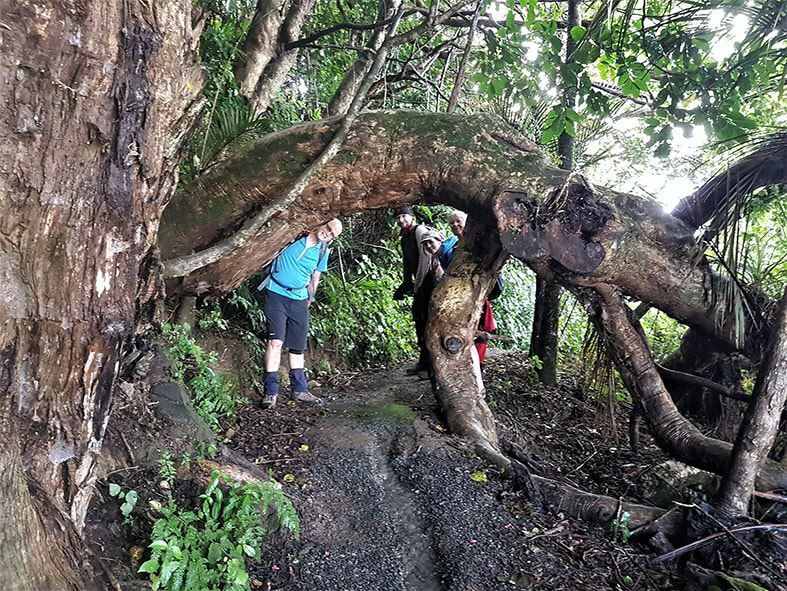 The tracks that run both sides of Oteha Stream, behind Massey University, looked like something out of the Hobbit, with little bridges and steps, and massive native trees towering 30-plus metres above the stream, creating a magical canopy above us. A great day out, despite the liquid sunshine, plus we covered some ground: 20.5 km in total. Another stunning day with the club on Rangitoto Island, which just happened to be the club’s foundation (first) trip 49 years ago! There was a nice, chilling southerly, always appreciated when walking on the heated scoria tracks. 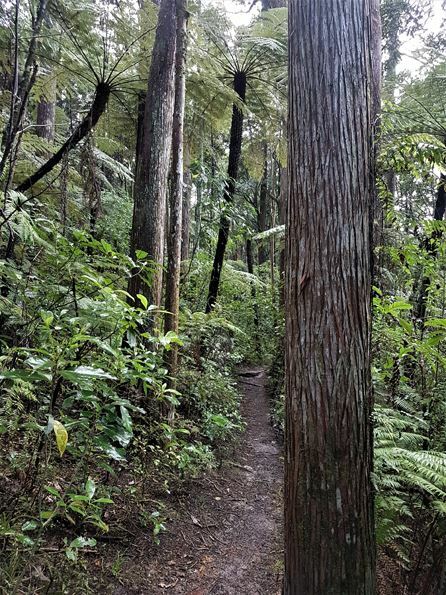 For those who have never been to Rangitoto, you’re missing out on its tropical beauty and native birds like kereru and saddlebacks, plus others that have migrated across from Motutapu or Motuihe. The melodic birdsong added to the atmosphere, with some brave birds foraging only a metre away from us. My group of five made a beeline for the supercool lava caves about three-quarters of the way to the summit. 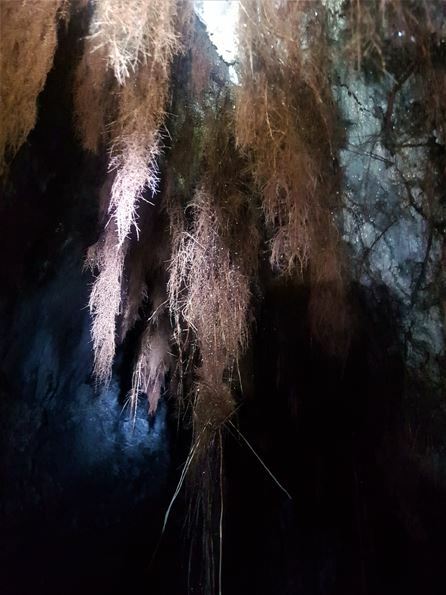 You can stand upright in the largest cave, and you can look up and see the gorgeous pohutukawa canopy through an open in the cave roof. 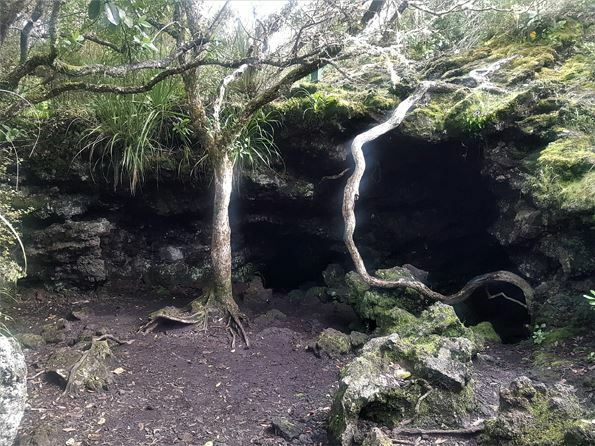 You can crawl into the other, smaller cave, which has red pohutukawa roots growing through the solidified lava into the cave. Very cool! We enjoyed majestic views at our lunch spot on the summit, where we met up with the other groups; one had circumnavigated the island, and the other had come up by an easier route. 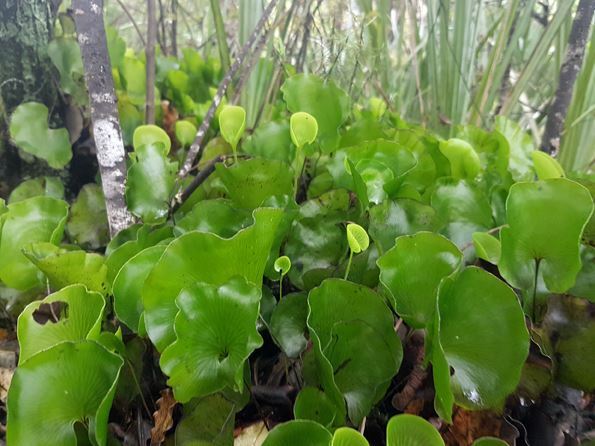 Post lunch we headed to the very tropical Wilson Park Track and lots of lush kidney fern. Some people went home on the earlier ferry, and the rest of us strode towards McKenzie Bay, picking up the fast group. 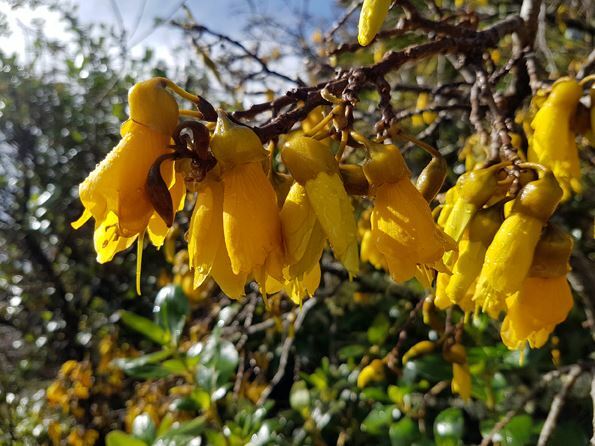 Then we all explored the kowhai grove, where the trees were just starting to bloom. After seeing many different varieties of gorgeous native orchids and other interesting flora, we headed for the ferry. Much fun as usual, out with the club. 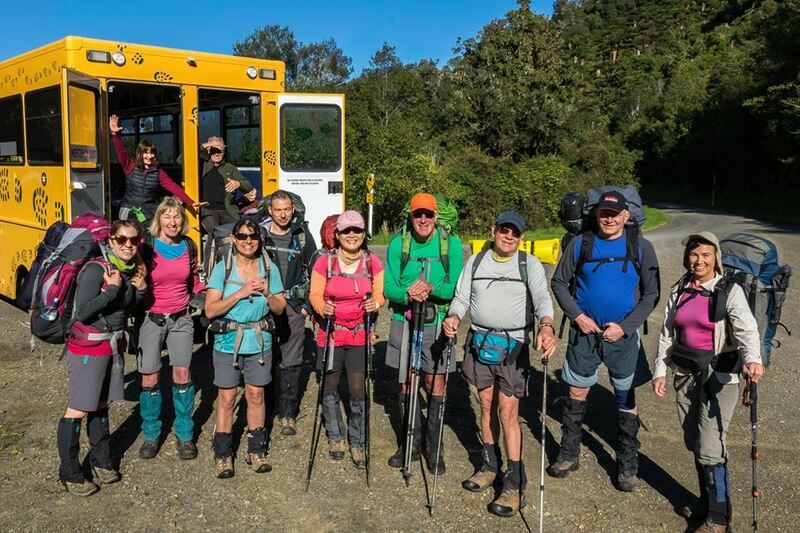 Potential newbies seemed to be put off by the thundery forecast, with not even one enquiry, but we still had a group of hardy trampers keen to do the club favourite, the Okura Walkway! Plenty of showers passed through, but most seemed to pass either side of us, at one point providing a spectacular double rainbow, which we all stood in complete ore of, madly taking photos. We moved to the other side of the swamp for a different angle of the rainbow. The gorgeous cloud reflections in the swamp and the gnarled old trees had us all clicking away again. There was plenty of mud and trapped water, which created some nice deep puddles to work our way through around the Stillwater end of the track. On our way back, the tide was almost fully out so we enjoyed the low-tide walk, spotting a pair of foraging dotteralls on our way around to the shell bank, and scrambling back into the tropical-looking, lush, completely sodden bush. An absolutely fantastic tramp for photos: the subtle light glinting on the water with a backdrop of heavy, dark thunderclouds was quite magical. We hope the photos will console you—or make you a little envious that you missed out. 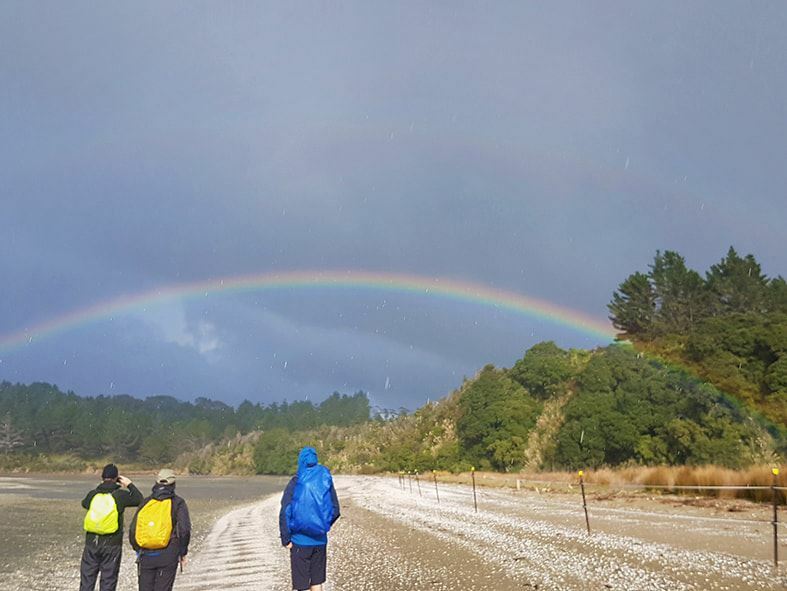 For those new to the club, it only rained on us once, very briefly, so please don’t ever let a bit of rain deter you from tramping. It’s a different experience, and it can be just as rewarding as when the weather is fine. PS We’ll try another open day in spring.